What comes to mind when you think of cedar pergola kits? Iconic, classic landscape design? Beauty, durability, rustic? Which of these are most important qualities when you’re considering a wooden outdoor structure for your garden? Cedar wood is used for pergolas for a variety of reasons. Cedar wood is used for pergolas for a variety of reasons. The rustic look of cedar wood enhances many outdoor settings. 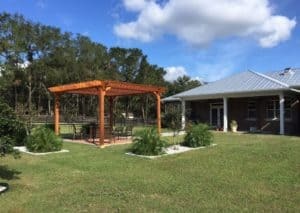 The flexibility of designing with cedar pergola kits can transform your backyard and fits with many styles. 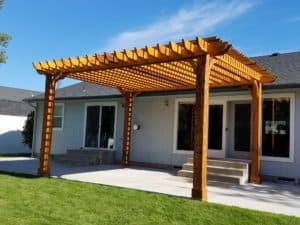 Cedar pergola kits can blend well with contemporary, classic, rustic, or traditional home designs. How do these qualities rank for your project? 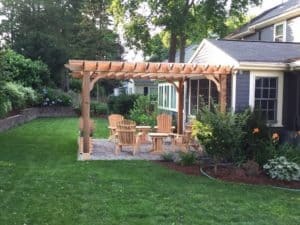 There are many uses for a pergola kit that’s built out of one of the top wood choices for outdoor structures. Cedar has long been a top favorite due to its classic sturdy look and beautiful natural color. 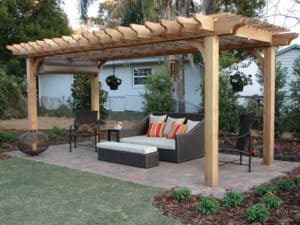 Cedar pergola kits are an easy way to make the most of your backyard space. Adding a pergola to your outdoor patio expands the usable area for year-round entertaining. Expand your options for where to spend your free time into the outdoors. An outdoor living room covered with a wood pergola and it could turn into your new favorite room! Cedar stained pergola with a rich hue like this 20×20 Big Kahuna pergola kit makes a commanding statement in this outdoor patio space. It doesn’t take a large pergola to create a focal point of your patio design. Cedar pergola kits can be built with varying amounts of coverage and in many sizes ranging from 8×8 up to 20×20 and larger. Whatever your outdoor design goals are, a classic looking cedar pergola can be the additional feature you’ve been looking for. We’re ready to help you with your outdoor patio pergola, so contact us today to get started!